Khaled Hasan (born 1981) began working as a photographer in 2001. At a young age he realized that photography is not just a play of camera but a play of life with light and darkness. He chose to take this path and experience culture and life at its fullest. Photography then became part of his identity—a force that makes him think, feel and understand human beings and life more. 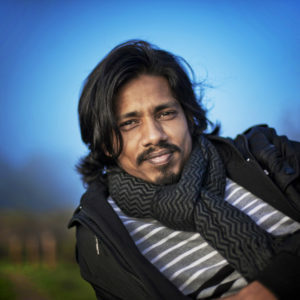 Since then, Khaled has been working as a freelance photojournalist for several magazines in Bangladesh and in other countries. His works were published by the New York Times, Sunday Times Magazine, American Photo, National Geographic Society, Better Photography, Saudi Aramco World Magazine, The Guardian, Telegraph, The Independent and The New Internationalist, Himal Southern, Women’s e-News, to name a few. Hasan’s documentary project ‘Living Stone’ has won numerous international awards including the 2008 All Roads Photography Contest of National Geographic Society; the 2009 Grand Prix “Europe and Asia – Dialogue of Cultures” International Photography Contest organized by Museum of Photography, Russia; 2009 Mark Grosset Documentary Prize, France; and UNESCO’s Humanity Photo Documentary Award, China. As an indigenous photographer, he tells narratives of the land that shaped him. Documenting stories about its people and their interaction with nature, healing and surviving from times of distress, fighting for rights, toiling for food, standing against injustice are the primary issues he features in his works. For Khaled, a story never ends; but continues to develop, fades or becomes part of history but may still be documented through photography. This is why he believes that it is highly important to crystallize changes in life, especially the ones that transcend times. For Khaled, being a photojournalist is not just being a very good photographer but being a socially responsible person too. He constantly finds fulfillment whenever his works benefit his community and the greater good. His involvement with the National Geographic Society, Inter-Press Service and other non-for-profit organizations in documenting cultural concerns show this passion of his. At present Mr. Hasan is working on his new project titled “Living Odd” to document past-present situation of Bangladeshi non-residents and immigrants who are living USA since long and capturing truth behind the sufferings and survival of migrants, mental trauma and cultural gaps between different races in America. He continues to hold exhibits across the world with locations such as London, Mexico, Russia, Syria, Japan, France, Uzbekistan, Canada, USA and China. # Winner, Samdani Artist Development Award, Bangladesh. # Emerging Photographer in Contemporary World, Nikon Asia, Malaysia. # All Roads Photography Award, National Geographic Society for documentary project ‘Living Stone’, USA.